It's Monarch Butterfly season in the Bay Area. But where did they go? 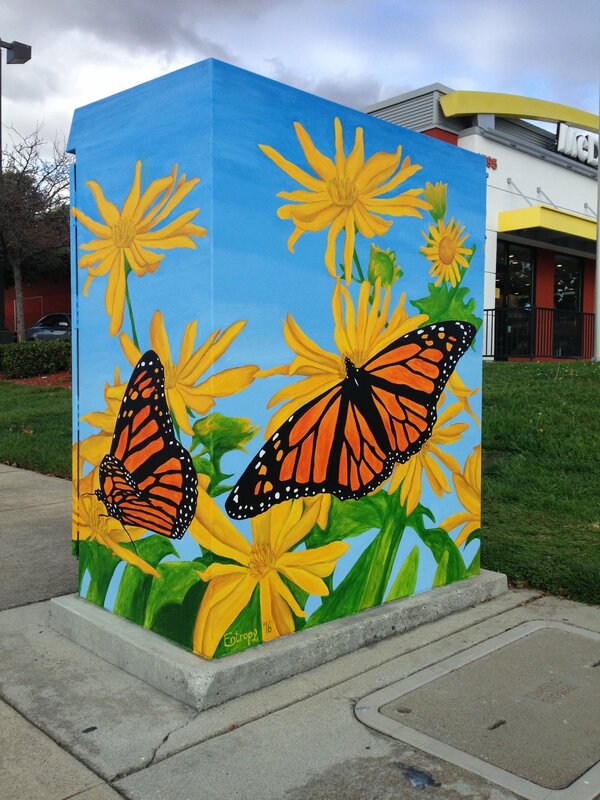 Earlier this year, I reported about my little Monarch invasion in Redwood City, and how their life cycles and marvelous migration from the United States and Canada down to Mexico inspired a whole series of Monarch Butterfly murals. The Monarch Butterfly is also known as “Danaus Plexippus” which literally means “sleepy transformation”. The name evokes the fact that this species migrates and hibernate as larvae, pupae, or even as adult butterflies. My Monarch Butterflies finally made their way down to Milpitas this month. People from the neighborhood were telling me how much they love these butterflies. But what many don’t know is, that Monarchs declined by 80 percent over the past two decades. This trend could lead to an extinction of the species. Scientists prognosticate that the Monarch migration could collapse within our lifetime due to habitat fragmentation, drought and insecticides. Milkweed is the Monarch caterpillars’ only food source, but this plant is becoming harder and harder to find these days. The main problem is the genetically engineered crops. They are made to be resistant to Monsanto’s Roundup herbicide, which is also a killer for milkweed. The aim of my artwork is to educate people about these endangered species and about the effects of their action. People have to take responsibility. Everybody is able to take care and to change the decline of Monarch Butterflies. To ensure the survival of this species, you only have to plant milkweed in your backyard. By bringing these species into the light, I hope that people can connect with their struggle. Monarch Butterflies are part of the Bay Areas natural history. When we lose them, the places we inhabit and our lives will become poorer. Wildlife species that are particular to our regions define it and make it unique. When we protect them, they become a symbol of our community strength.